Whether you’re looking for bright, colourful suitcase sets for holidays abroad, or smart, professional cases for business travel, these are the best luggage sets around right now. 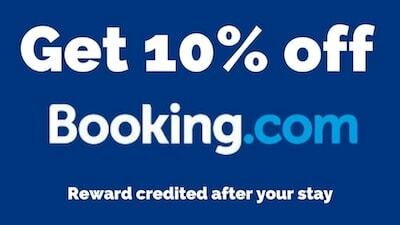 So you’re looking for a new luggage set? Perhaps you’ve bought single suitcases before, and now you’re thinking you could do with a selection of different sizes for varying uses. I always think people look so smart at the airport when they have cabin baggage that matches their main suitcase. 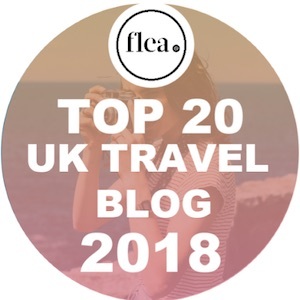 In terms of price, buying a luggage set is often more cost-effective than buying two or three individual suitcases, so it’s a bit of a no brainer! I also love how many options there are now. From bright, patterned cases, to smart leather, to soft and hard side suitcases, there’s something to match whatever you’re looking for. So, it’s time to check out the best luggage sets around right now. Antler is one of the leading luggage brands for a reason. The cases are high quality and last for years and years. I love how stylish the Juno 2 range looks. While I personally like this rich shade of purple, they also come in orange, bright pink, bright blue, black and white. The set of 3 covers all the standard sizes, but you can also buy them individually. They’re tough and durable with 360 degree rotating wheels which, as a nice touch, match the colour of the case! If you’re looking to buy a set of Antler Juno 2 cases, but are on a budget, check the prices of all the colours, as I’ve noticed a few price drops happening on one colour at a time. American Tourister is one of my favourite luggage brands. Their cases are practical yet fun, and always come in a variety of bright colours and designs. The Soundbox is a fave of mine, but this WaveBreaker set has an eye-catching design with its horizontal pattern. The material is designed to protect against scratches, and the double wheels make it super easy to travel with. The Wavebreaker cases come in 3 sizes (55, 67 and 77) and feature 3-digit TSA approved combination locks. The black is smart, but if you’re looking for something more fun, they’re also available in pink, blue, yellow and teal. 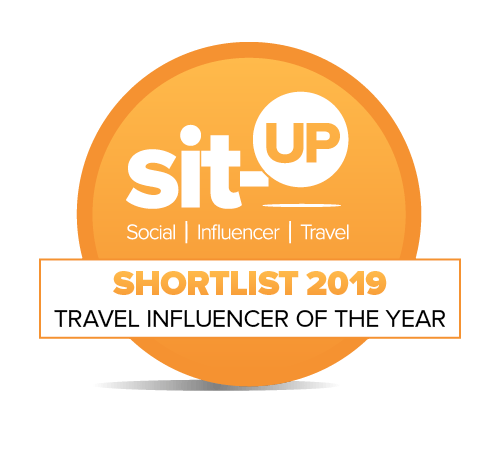 I’d definitely recommend American Tourister luggage. 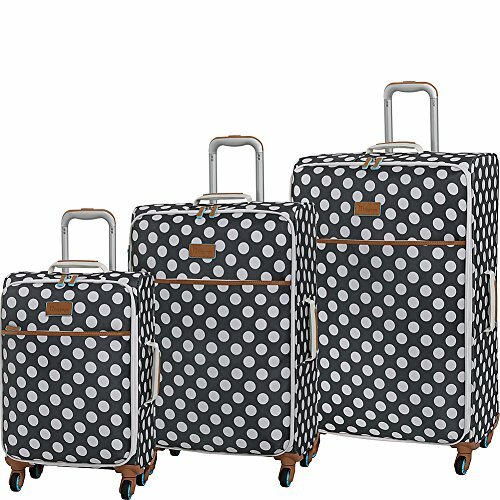 This 3-piece luggage set is super light, and with its bold print, it’ll be easy to spot at the airport. There are several fun colours and patterns to choose from, but this teal one is my personal favourite. 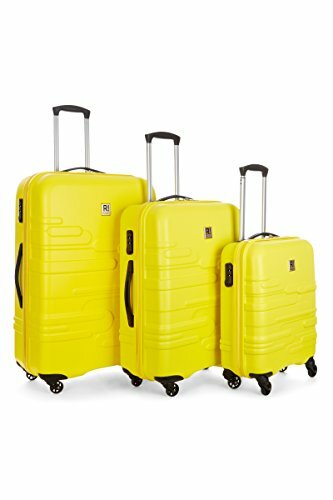 The suitcases come in 3 sizes standard sizes (55, 68 and 78) and have 360 degree spinner wheels, telescopic handles and 3-digit TSA approved locks. The cases are made from ABS, which is known for being lightweight and hard-wearing. I like that you can buy this as a 2-piece luggage set as well as a 3-piece set, depending on your needs. Antler’s sister brand, Revelation, makes fun and stylish suitcases. I’ve got 2 at home. They’ve lasted years and are still in a great state despite travelling the planet with me! The Amalfi set put a smile on my face as soon as I saw it. Just look at that shade of yellow – it’d always be easy to spot at the airport! If yellow isn’t your colour, don’t worry, they also come in bright blue, red and grey. The Revelation Amalfi cases are made from tough, scratch-resistant ABS. They have 360 degree rotating easy glide wheels, plus a fixed combination lock. As an added bonus, this suitcase set comes with a 10 year warranty too. Something a little different, this 2-piece suitcase set made by Unitravel oozes vintage vibes. If I spotted someone at the airport with this set I think I’d assume they were famous or worked in fashion! 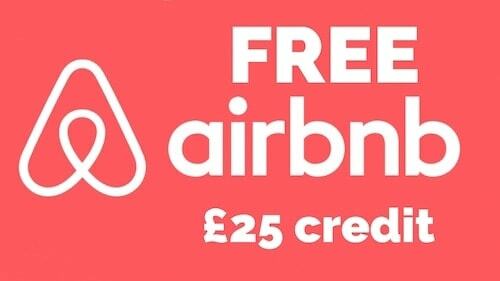 It’s one of the more expensive options on the list, but let’s face it – this is as much a fashion accessory as it is a practical travel item. It comes in this blue floral design, plus one that’s pink. It has a magnetic buckle and combination lock, and the outer shell is made from a lightweight resin fibre board. It’s light, scratch resistant, waterproof and durable. 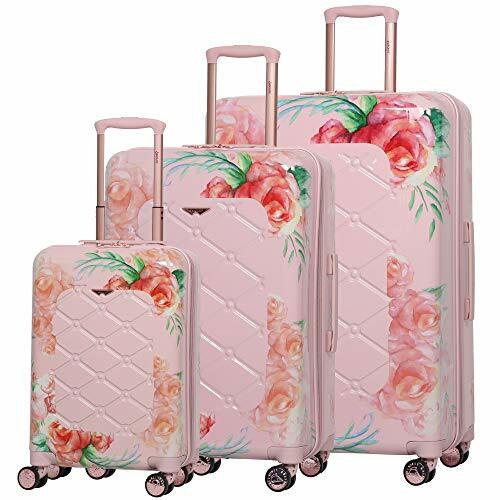 HOW CUTE IS THIS LUGGAGE SET? Sorry for my excitement!! 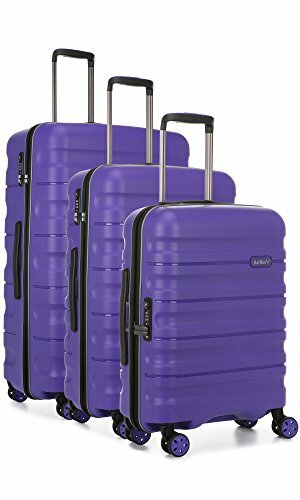 I discovered this Aerolite case when I put together my guide to colourful luggage, and I’m so happy it also comes in this 3-piece set. While I love the girly pink floral suitcase, there’s a darker option too, if you prefer something a bit less kitsch. 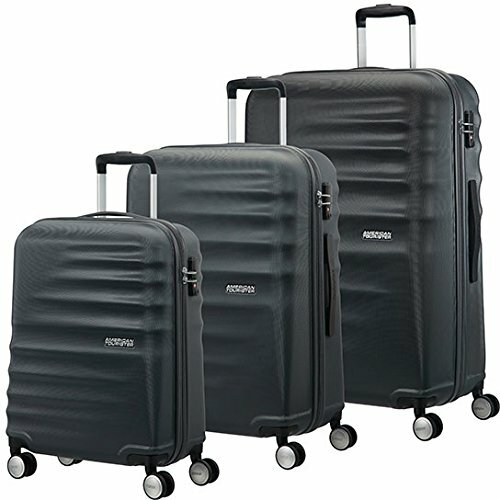 The Aerolite cases are super light, have easy 360 degree wheels, and come in 3 sizes (49, 63 and 73). They have 3 digit combination padlocks plus they come with a 5 year guarantee. 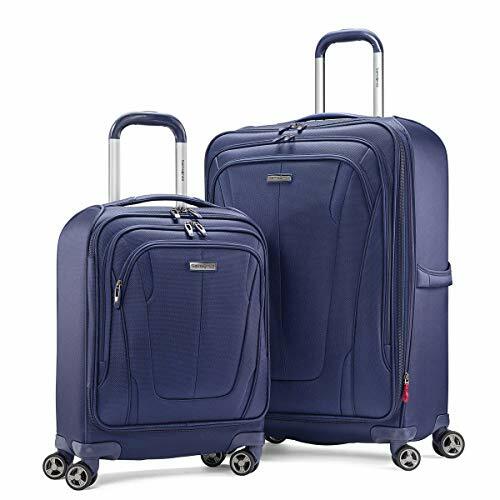 Samsonite are one of the best luggage brands in the world, and this 2-piece suitcase set would be perfect for business travellers. The cases are durable, water-resistant, made from 100% Nylon and have dual spinner wheels. The ergonomic handle improves comfort when travelling. 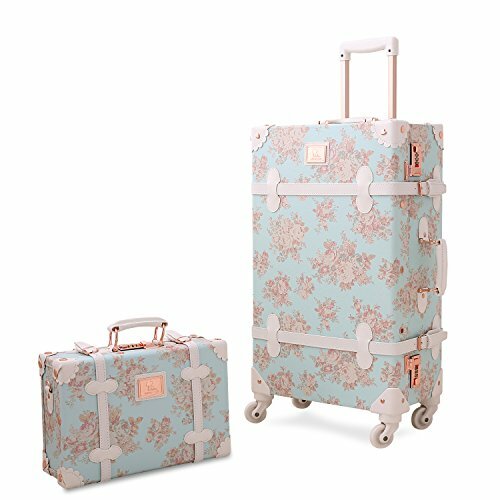 The 2-piece set includes one cabin case and one large suitcase. I like how the cases have a special panel with shoe pockets, to help you pack more effectively. The GT range comes in this shade of navy blue, plus a charcoal option too. While there are lots of hard-shell suitcases, and a few soft ones, there aren’t that many made from leather (or leather effect). I really like this set, which also happen to be exceptionally good value! They’ve got a smart business appearance, with their tan leather style exterior, and aluminium frame. They come with TSA approved locks, 360 degree spinner wheels and comfortable handles. I couldn’t see any reviews of this set when I was compiling this guide, but hopefully they’re good! Rose gold seems to be THE colour of recent years, so no doubt lots of you are looking for a chic rose gold luggage set! 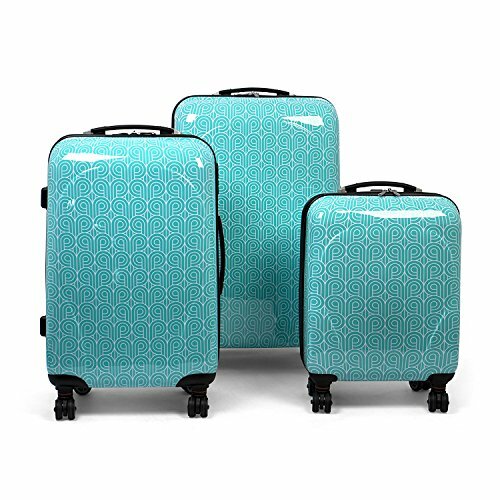 This 3-piece luggage set comes in standard sizes (47, 63 and 73) and has a strong ABS outer shell. It’s nice and lightweight with 360 degree rotating wheels. It also comes fitted with a 3 digit barrel padlock. 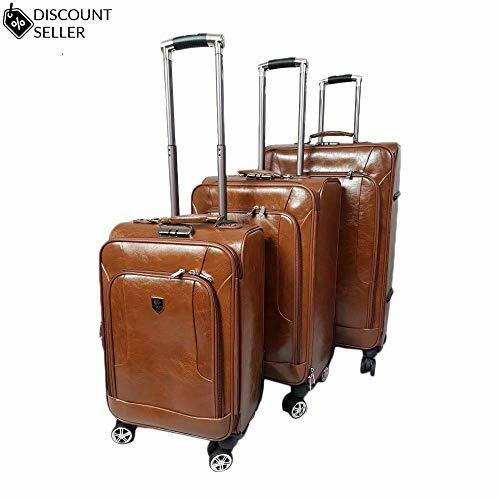 This luggage set has a 5 year guarantee. Oh and if you’re not feeling the rose gold vibes, the set also comes in blue, red, silver and black. 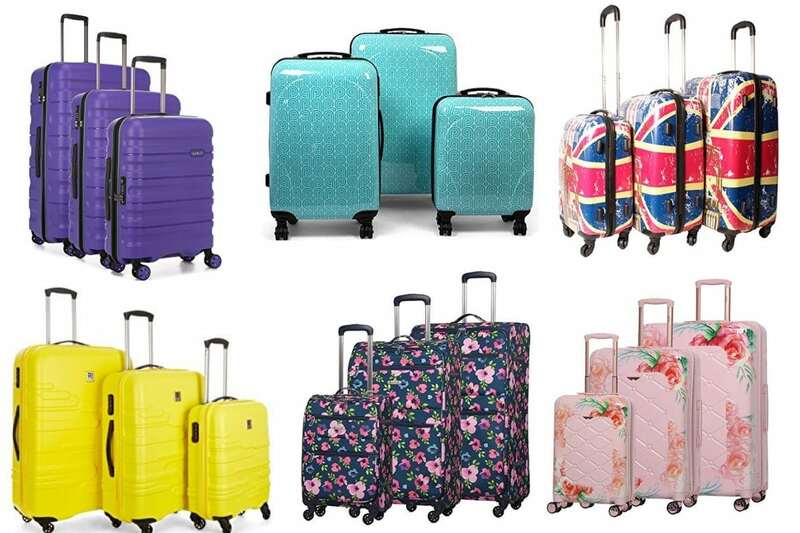 If you want a fun luggage set, then this might be perfect for you! 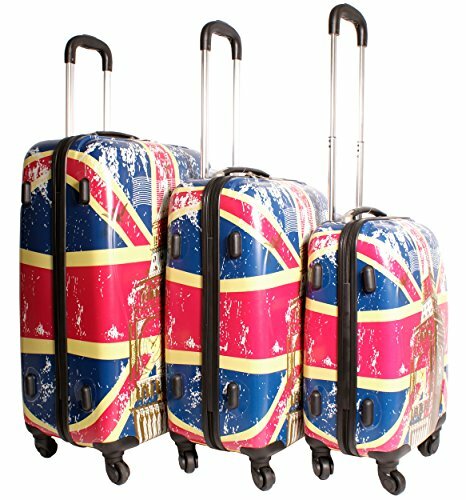 This 3-piece hard shell luggage set has an eye-catching Union Jack and Big Ben design. The 3 cases are standard sizes (cabin suitcase plus a medium and large case) and have combination locks. They’re super lightweight, and fit a considerable amount. But mainly, they’re fun, and perfect for lovers of the UK! Do you love spots? Polka dots? I think this case would be PERFECT for you! It comes in several colour options, including green, blue, red, black and brown. I love the leather effect details too. The IT cases are known for being nice and lightweight, plus easy to wheel, wherever you’re travelling to. Even better, this luggage set comes with a 10 year warranty! 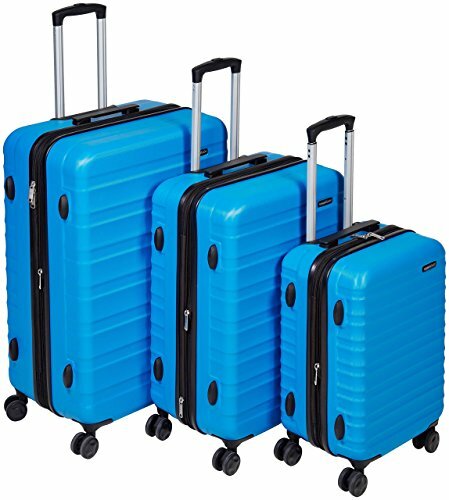 I really love the vibrant bright blue of the AmazonBasics suitcases. You’ll always be able to spot them on the conveyer belt! They also come in orange, navy blue and black too. 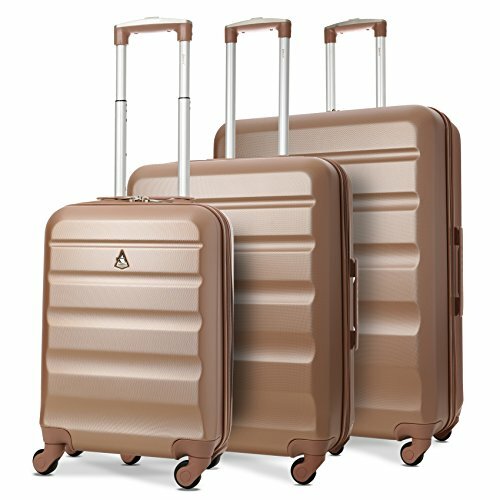 The hardside spinner suitcases are made from extra-thick ABS and have a scratch-resistant finish. They’re some of the few hard cases which are expandable, squeezing in up to15% extra capacity. 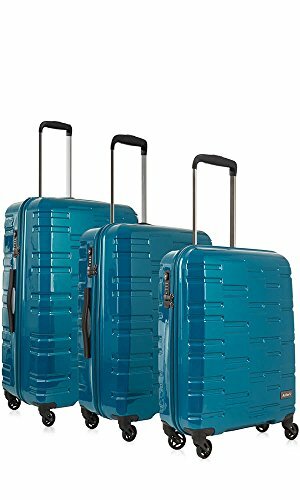 The reviews are really good for this luggage set, so it’s definitely one to consider. 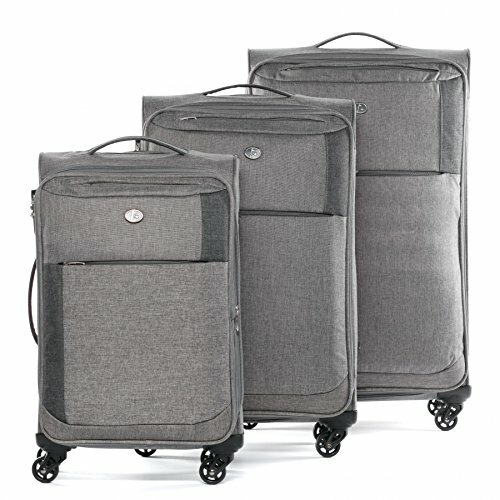 This set of 3 expandable suitcases makes a change from all the hard shell cases around at the moment. They’re soft, made from an extra strong durable raw denim material, which stretches to accommodate your belongings. I really like the handy laptop sleeve which is built-in – makes it super functional. This set also comes in three colour options, each smart and stylish. They also stack inside each other when you want to tidy them away. As mentioned, I would recommend the Revelation brand, having used 2 of their cases before. This fun, colourful luggage set is made from scratch-resistant tough ABS. I love the triangle embossed design too. The Echo cases have 360 degree rotating wheels, fixed combination locks and also come with a 10 year warranty. Oh and while the pink is fun with a navy interior, there’s also a grey option which is smarter, and more masculine. 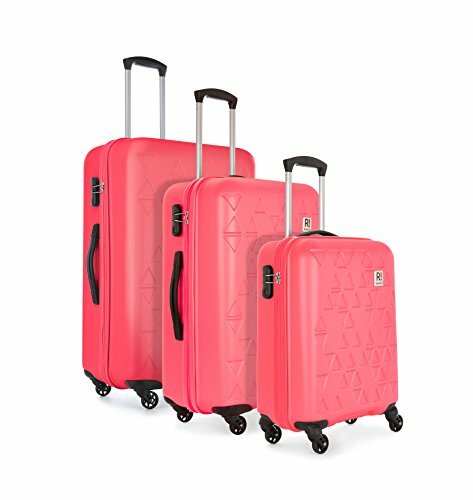 This luggage set by premier brand Antler is made from a high shine Makralon Polycarbonate. It’s tough but light and comes with easy glide wheels and a TSA approved combination lock. I really love the style, teal colour and indented pattern. It’s stylish and fun, and I can imagine spotting people at the airport with this set and being pretty jealous! It’s not the cheapest set around, but I’d definitely say this is the kind of luggage set which will last a long time. 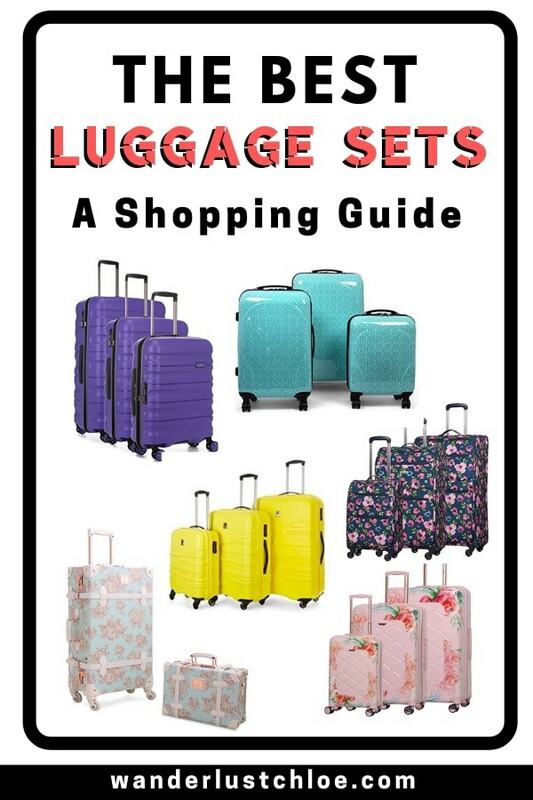 So all the options so far in my guide to luggage sets are for adults, but here’s one for the kids! This one has a really fun design, with cute owls on it! 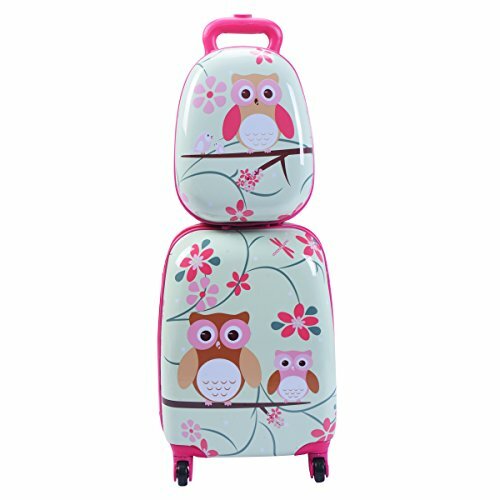 It’s a 2-piece set, comes in 4 styles (incase the owls aren’t what you’re looking for) and includes a small case and a hard case backpack. The 360 degree wheels make this case really easy for kids to push or pull along. Similar to others on the list, the cases are made from a tough, durable ABS material. You can also wipe them clean. Oh, and while it’d be a great set for a holiday, some kids might find cases like this useful for school too! Floral lovers – are you seeing this? 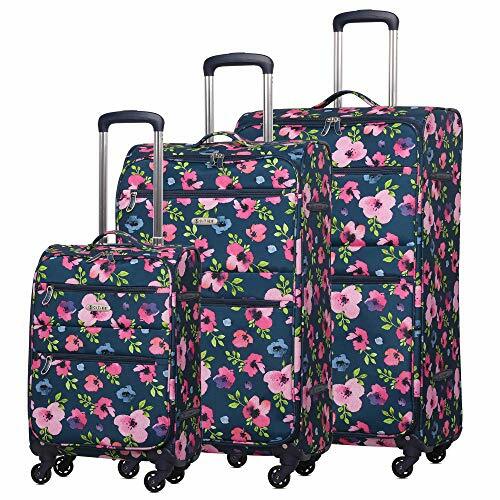 This fun 3-piece floral luggage set was MADE for you! I know some people aren’t keen on the hard shell cases, so this is a great option if you want a material luggage set. The cases have 360 degree wheels, an easily retractable handle plus a 3-digit padlock. Oh and they’re covered by a 3 year warranty too. If you’re keen on the style, there are 3 other floral designs to choose from.